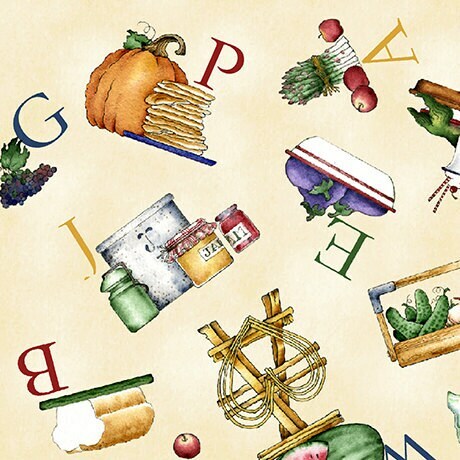 Hungry Animal Alphabet - Food Toss Cream Yardage by J Wecker Frisch for Quilting Treasures. 44-45 inches wide. A fun addition to the Hungry Animal Panel and alphabet fabrics in red and cream which are all listed right here at The Quilted Nursery Children's Fabric Store. Create a fun quilt in just a few hours. All fabric at The Quilted Nursery Fabric Store is cut directly from the bolt and sold by the yard. If you require special yardage please send us a message and we will be happy to accommodate your request. Same day shipping always! This material was just what I needed. The picture matched the product and it was delivered quickly!